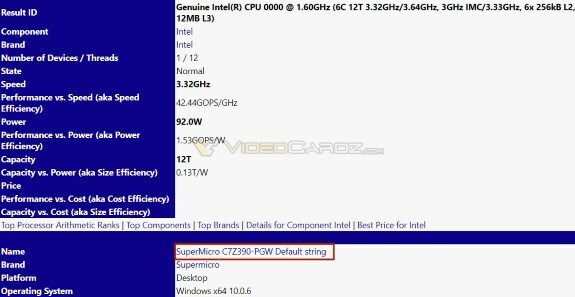 A couple of weeks ago, VideoCardz found evidence of a SuperMicro B360 motherboard in the database of the SiSoft Sandra benchmark and now the site spotted the first motherboard based on the Intel Z390 chipset. This board is also made by SuperMicro, the database listing reveals the system had an unknown six-core CPU with a 92W TDP. Intel's Z390 chipset is expected to be introduced in the first half of 2018 and word is going around that one of the new features will be support for eight-core mainstream processors.